It will go on eyeing God and believing for His best even when happiness has long since made tracks. 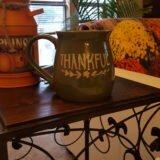 I meant to write this Thanksgiving 2nd Cup two weeks ago. I’d been mulling over what to include, what to leave untyped, and what to ignore altogether. Then a flu virus struck. I manned up and spent five days trying to ‘doctor’ myself while carrying on with normal household duties, as well as the manly-man upkeeping types of stuff. It was finally time to see the doctor. I’ve virtually no autoimmune system left. That means colds or flu, etc. don’t just strike me. I get seriously mugged. Both my ER doc friend I saw Saturday and the sharp intern I followed up with on Monday agreed in what they suggested. They gave me an antibiotic regimen – in liquid, for me – and suggested OTC Benadryl for what seemed a possible allergic reaction to it. Again. Happy? Not exactly. Joy-filled? Yes–by choice! With Benadryl on board at bedtime, my body was up this morning before I was. Some of you know what I mean. It can be comical and magnificently embarrassing at the same time. From whence, then, derives my joy? I am not merely still here; I’m massively so. No, I don’t look imposing or snappish. That’s tough to pull off with Benadryl gazing half-lidded at my entire system, nodding slowly and being like, “Duuuude . . .” Though I may be functioning in stand-by mode for a few more hours today, I’m joy-full because I’m here. I’m able to breathe. Born to a 43-year-old mom, I had pulmonary issues, as one of my lungs collapsed at or before birth. Because of the weakness, I had asthma from birth until I was 10 or 11. God’s blessed me with strong lungs since that time, yet whenever a virus does get through my defenses, it really grabs on. Even with all the normal phlegm/sputum junk that goes with kicking a virus, I’ve been able to breathe deep and free for, let’s see– Average adult respirations are at 21,600 per day. Do the math. God’s lavished on me multiplied millions of breaths since 1997 I never believed I’d have. I felt well enough to tackle pre-company chores yesterday morning. And I actually got things upstairs spiffed up so I wouldn’t feel embarrassed having everyone gather in for this afternoon’s wonderful meal. It’s easy for me to overextend, meaning I expect to get way more done than my chronic fatigue will allow. It’s frustrating, even discouraging if I allow it. I work at now allowing it. I am most grateful for all those things God could have allowed to occur in or around me that never happened. I’ll not know anything about any of them unless that’s part of what Heaven’s screening room is about. Otherwise, I doubt it’ll matter then. Truth is, everyone has challenges. You. Me. All of us. We each learn how to cope, how to incorporate all that into our ‘Now’. I’ve stared right at mine long enough to know how incredibly blessed I am to live, let alone to keep trying to use and perfect what God’s left me. Knowing the nature of my known challenges, I can only surmise how many are those of which I know – may never know – about. So, once again, The Boone clan will crowd around a table lovingly prepared and loaded down with far more than we would ever need. We will take each others’ hands and sing GREAT IS THY FAITHFULNESS by way of blessing the food and our enjoyment of it together. Next will follow the usual raucous, fun time of table games. We will thus celebrate together in mutual, joyful praise and gratitude to God for yet another year of living. May this find you and yours doing the same. If so, our joy will be even more complete. 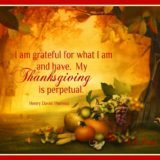 Wishing all of you a blessed Thanksgiving!! !